#18. What does it mean to pray "in the Spirit?" A Second Printing for "Resisting Gossip Together!" 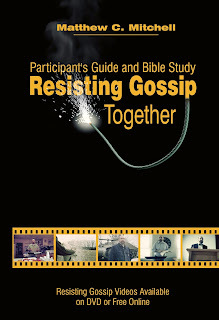 CLC Publications has had to order a second printing of Resisting Gossip Together, the participant's guide and Bible study. To learn more about Resisting Gossip Together, read this interview I did with the Biblical Counseling Coalition. I also have a page on this blog dedicated to extra resources that fit with RGT and each lesson in the book also has a corresponding video that teaches the essential message of each chapter. It's wonderful to hear stories of people who are using RGT to deepen their understanding of the biblical teaching on gossip and also bring together a study group to work through the material with one another. Pastor Brad Bigney of Grace Fellowship Church in Florence Kentucky recently said, "A+++ I would use them again." So encouraging! A great place to purchase Resisting Gossip Together is Westminster Bookstore who also has a starter pack of 5 books and study guides at 35% off the list price. 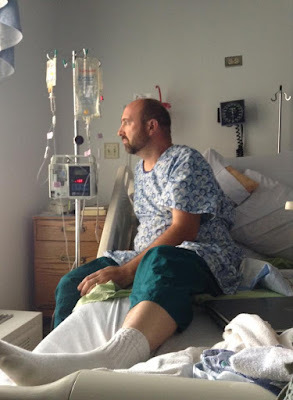 Both readers of this blog will have noted that there hasn't been much fresh content here this Summer as I've been dealing with diverticulitis and other intestinal difficulties. As I said in church a few weeks ago, Heather has started saying to me, "I hate your guts!" And so do I. It's been a difficult Summer with office visits, "listening to my body" (which apparently speaks a foreign language I haven't learned), and trying to estimate my limits. At the same time, I know that so many more people have gone through so much worse than I have. I am grateful for each and every day and the gifts in each and every day. God's mercies are daily served up fresh and hot. I've been trying to learn spiritual lessons from our Lord's School of Affliction and lean on Him for peace, joy, and wisdom. This path led me to the hospital again over the weekend because of increased pain even while on antibiotics. And now we've confirmed a surgery (a bowel resection, sorry for the gory details) on Wednesday. This is a great relief to me because, while painful to undergo and to recover from, it should solve most of the problems I have been experiencing this Summer. So if you have been praying for me--thank you--this is an answer to them! I feel very loved and cared for by my friends, family, and church family. Pray for me as I continue in the hospital being prepared for surgery. I feel better today than I have in some time. Pray also for Heather and the kids and for our loving church family. 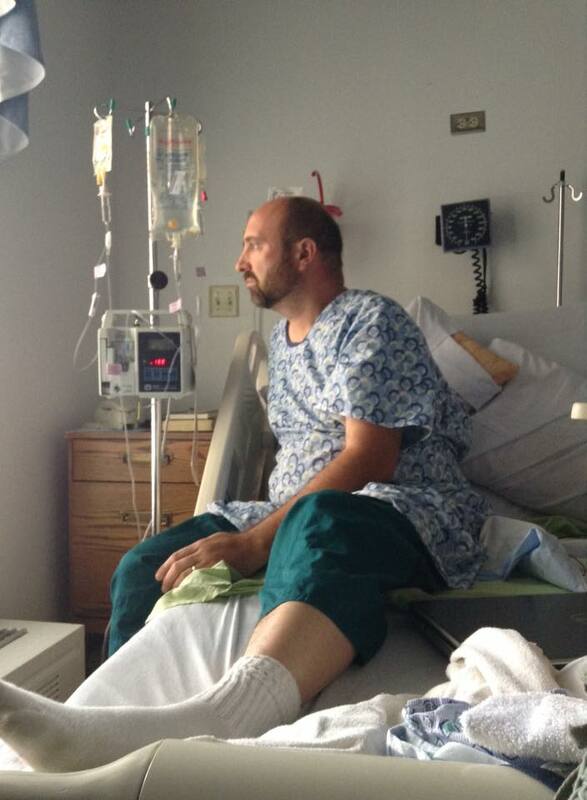 My friend and author photographer, Schenley, captioned the above photo as "This is going on the back of your next book, Resisting Diverticulitis: Winning the War of the Leaking Gut (or, What Happens When You Ask God to Teach You Through Your Suffering.)" 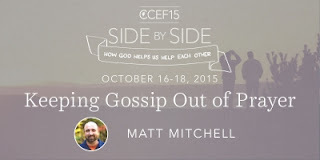 CCEF has published my article "Keeping Gossip Out of Prayer Requests" on their blog. I'm looking forward to sharing a breakout session at their upcoming national conference "Side by Side: How God Helps Us to Help Others" in October. Gossip is notoriously hard to define and even harder to resist. It is as alluring and addictive as it is dangerous and hurtful to others. This workshop will equip those involved in personal ministry to grow in their ability to recognize gossip when they encounter it, to resist gossip when they are tempted to listen or pass it on, and to respond in faith and love when they are the unwitting target of harmful clandestine talk. I love the ministry of CCEF (I call myself a "CCEF-Junkie") so it's a great privilege and deep pleasure to partner with them in this conference. I can't hardly wait. #17. 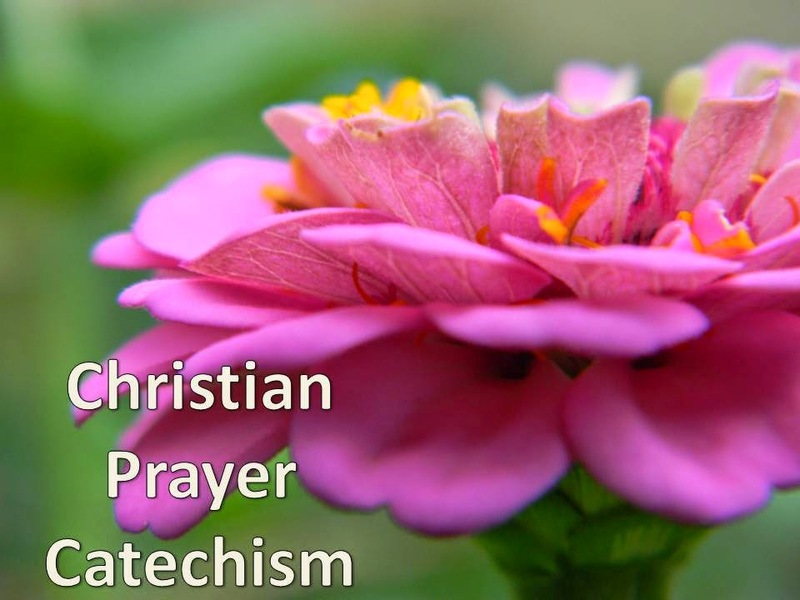 What does it mean to "pray without ceasing?" [Matt's Messages] "Encounter the God of the Universe"
And by that, we don’t mean encounter the god that the universe is. We mean encounter the God who made the universe in which we live. Encounter the God Who created everything that there is. That’s the God our kids have been learning about all week long. And when I thought about that theme, my mind went to the 147th Psalm, especially verse 4 which Marilynn put on the cover of your bulletins today. Psalm 147 is about encountering the God of the universe. And more than just encountering Him, worshiping him, and more than just worshiping Him, wondering at Him, and more than just wondering at Him, putting our hope in His unfailing love. I have just three short points this morning. All are application. This psalm wants us to encounter and respond to the God of the universe in at least three ways. Did you hear all of the worship words in this psalm? Do you know what the Hebrew is for that? It’s just right to praise God! And the guitar, and the bass, and the keyboard, and the drumset! Praise, Sing, Extol. Those are worship words. This psalm wants us to encounter the God of the universe and bring Him the worship that He deserves. Does the psalmist give us any reasons to worship God? You bet he does. This psalm is just loaded with reasons to worship God. And they turn on two different points. One is that God is the amazingly powerful creator of everything and Lord of the universe and the other is that God lovingly cares for His people, in this case, the Old Testament people of Israel. This psalm was probably written after the exile of Israel when they were being restored to the land. The story covered in the books of Ezra and Nehemiah which the adult class talked some about this week. The LORD cares for His people. Verse 13 has the same theme. Again, that’s in the age of the Old Covenant. God had a special relationship with Israel, and the psalmist says that because of that God’s people should worship Him. But most of the verses talk about how powerful He is over all of creation and how that should lead us to worship. Do you see how God is credited with being responsible for nature? How God is in control of everything, including the weather? Everybody cares about the weather, but none of us can control it. And because of that, God deserves our worship. More than that, God deserves our wonder. Our praise should be full of marveling at God’s majesty. This theme is so clear in verse 4. This is a God who deserves astronomical praise! That is a mind-blowing statement. Do you know many stars there are? Without Googling does anybody want to take a stab at how many stars there are? That’s 7 times 10 to the 22nd power. If I’m doing the math correctly, and that’s always a possible concern, 70 billion trillion is a 7 with 22 zeroes after it. And that’s just the stars in what astronomers call the "Observable Universe." There may be and most probably is more than that out there. Our LORD determines the number of those stars. And the psalmist says that He calls them each by name. Now, I don’t know if that means that God has His own pet name for each individual star, but it does mean that He created each one and is Lord over each one. Doesn’t that make your brain bubble? When Heather and I were in California last month, we walked on the beach in Carlsbad each night. And one night while we were there, Heather was taking pictures, and I just watched the waves come in and go out. Come in and go out. And I thought about how many grains of sand there are and how I could never keep track of them, coming in and going out. And right now, that same spot I was standing in the waves are still coming in and going out. Pounding away. And I thought about how God knows every wave pounding that spot on that beach for however long. And more than that, He knows every spot on every beach in the world. The Lord Jesus said that every sparrow that hits the ground is known by God the Father. Wonder at the God of the Universe! But not just at how big God is. Wonder that that God wants a relationship with you! That’s what’s been so amazing for our kids to think about this week. The God of the universe who is not impressed by anything or anyone, wants us to enter into a personal relationship of faith and followership with Him. This psalm wants us to know that it’s because we’re so wonderful ourselves. He’s not impressed with the proud. He’s not looking for help. He’s not look for strength. He’s not looking for strong people to join His team. You know when I first read this psalm this week, it seemed a little proud. Especially in verses 19 and 20. It sounded a little snooty to me. But it’s not like that. This is WONDER. This is amazement. That God has reached down to us? Not the strong? But the humble? Not the powerful but those who fear Him and put their HOPE in His unfailing love. Hope in God’s unfailing love. The God of the universe is worthy of our worship. When we encounter Him, we will wonder and praise and extol and sing. And that God has invited us to put our faith in Him and Him alone. Hope in His unfailing love. And you and I know so much more about this God than the psalmist did. We know that this God who names the stars humbled Himself and came to earth as a little baby. And then lived a perfect life and died on the Cross to save us from our own sins. And then came back to life to give us life. And it is our own only hope. I wanted to connect with you because I just re-read Resisting Gossip, and I was convicted afresh of the power of our words. Resisting Gossip is on my personal "re-read" list. I have some Christian books that I read every 1-2 years for reminders, encouragement, and fresh conviction. God's Word is alive, and His teaching impacts us in fresh was as we find ourselves in different circumstances. As I read the book for the second time, I was especially struck by the statement that I do not need to say something just because I think it. I realize that I have been using careless words lately, feeling justified speaking them without considering their negative impact. Also, I love how RG consistently brings readers back to the gospel. Ultimately, we as Christians do not need to be overwhelmed with self-hate or wallow in disappointment since we have the tremendous privilege of access to Christ's power as we apply 1 John 1:9. I was also reminded about how important our heart condition is, since words flow from our heart (Matthew 12:34). Thanks, Allison, for reading, then re-reading my book, but thanks even more for putting what you learned into practice! #16. What has God promised us to do with our prayers? Katie Faris has recently launched her first book, Loving My Children: Embracing Biblical Motherhood (paperback with a e-book version coming soon) with a corresponding Facebook page. I've read it, and it's really good. I'm not a mother, but I'm married to one and pastor a church full of them. Moms will definitely profit from reading this book. In future days, I hope to offer a giveaway contest for a free book, but don't wait for that to get your copy. Buy one for you and for a young mom you love. You can open your Bibles to John chapter 20, if you want to, but today’s message is going to be very brief. I wanted to give you a chance to hear fully from your team that was sent this week to Pittsburgh to share the gospel with people who need to hear it. And really, for the message today, I just want to wrap up all of what has been said into one word. A biblical word that I think we should give some more thought to in our lives. 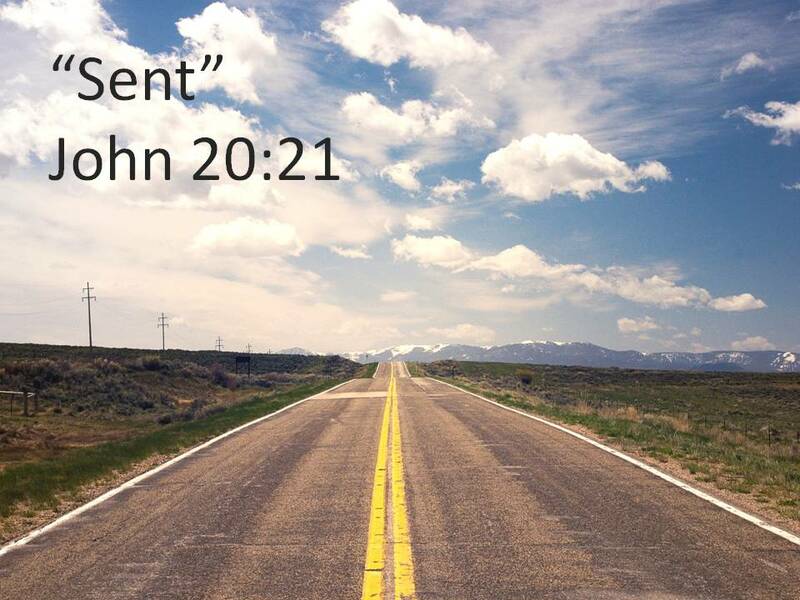 It’s the word “sent.” Or “send.” And it appears in the gospel of John chapter 20. There are actually two different Greek words in that verse that are both translated with the same English word “sent” because the idea is basically the same. We have been given a mission. John 20:21 is part of that great story of Jesus’ resurrection. It’s one of His appearances after He was raised, the one right before He encounters Thomas. And I’m not going to read the whole thing to you. I’ll just say this: the doors were locked and then Jesus appeared and said, “Peace be with you!” and then He showed his hands and side to the disciples and they were overjoyed. And I’m not. I’m not a foreign missionary. I’m not really a cross-cultural missionary. I’m not one of those folks across the back of our wall that we pray for and send money to, may their tribe increase! We need more foreign missions cross-cultural language-learning take-the-gospel-where-it-hasn’t-been-yet workers to go out into the world and share the good news. I’m continuing to pray that God will raise up career missionaries from our midst here. But there is a very real sense in which I was a missionary this week. I was sent on a mission. I was sent on a mission with a missions team. You’ve heard all about it this morning and seen some of our 1,800 pictures. These folks up here were missionaries. They were sent on mission. Who was the greatest missionary ever? It wasn’t William Carey, the father of modern missions. It wasn’t Jim Elliot who gave his life for the mission. Or Elizabeth Eliot who went back. It wasn’t Hudson Taylor or David Livingstone, as great as those missionaries were. It wasn’t even the Apostle Paul. It was Jesus. He was on a mission from His Father. He came to be the Word. He came to be the Savior. And after He died and came back from the dead, He sent His people on a mission. Now, of course, there are ways in which Jesus was sent that we never will be and the apostles weren’t either. He was sent to be crucified, and I’m pretty sure He didn’t mean here that all of His followers would be, too. And there is a sense in which John 20:21 applied most directly to the apostles and not to us. They were all sent as authorized representatives, apostles, who had an authority that we do not. I think this is true for every Christian, no matter who you are. No matter where you’re from or where you live. You and I are sent. Some people are saying we need to live a missional lifestyle. And by that they mean we are supposed to see our lives today as missionary lives. Whether or not we ever move. And your team hit the road this week. We were only 2 hours down the road but it’s different world there. And we’re not all called to go down the road. But we are all sent. We have a mission–to make disciples of Jesus Christ. We have a message–the gospel. And we are sent to share it. Do you see yourself as sent? I believe that the church in America needs to increasing grow in understanding that we are missionary church sent to America. For a long time, because of the rich heritage of Christianity in America, we have had a kind of “home-field advantage,” and have even thought of America as some kind of a Christian nation, if such a thing could exist. And we’ve gotten comfortable and thought of America as our home. But we are not home. We are guests here even if we have American citizenship. He’s our King of Kings and Lord of Lords. And we are to be ambassadors for Him. Even if we never move an hour from where we were born, if we are Christians, we are SENT to where we are. Sent on a mission and sent with a message. And that should increasingly affect the way we think about ourselves and how we should act. How do missionaries act when they arrive in a new land? They learn the culture, don’t they? They learn the language, the customs, and they begin loving the people there. And they constantly look for ways to bridge the divide with their new neighbors and provide a bridge for the gospel. And it might look like Family Bible Week and the Good News Cruise. Do you see yourself as an ambassador? Ambassadors have to live with the values of the land they are from in the land they are visiting. That’s us. We live the values of the kingdom of Jesus while we live in the world. And we try to bridge the gap. We give no offense that is not necessary for our mission and our message. We don’t give personal offense if we can help it. Only that offense that comes with the mission and the message. I was talking yesterday with Tim & Kelly Beck about their move. They are here this week and then next week, and they’re off to the Harrisburg area. They’ll come back to visit, I’m sure. But this couple has a deep and growing sense of how God is calling them to be SENT. God is sending them to that area. Not to be professional missionaries but to be ambassadors of Jesus over there. Next week, I’ve asked for them to share a little of their story of how God has confirmed this calling on their lives again and again. The point is that we are ALL sent. Whether you go over the ocean (and I’m praying for more of you to go!) or over the 3 rivers to Mount Washington in Pittsburgh (and I’m praying for more of that) or if you don’t even go over the mountain to State College, that you would see yourself as ON MISSION for the Lord. Sent on a mission to make disciples. Sent on with message to see people’s lives changed now and forever. #15. Does God hear the prayers of nonChristians? I was as surprised as you probably are that we aren’t opening our Bibles to Romans again this morning. However, it’s clear to me that we should take a brief break from Romans for the next three weeks and then come back to it at the end of the month. Don’t worry! I still plan to finish Romans in less than a year. I promised not to be one of those pastors who go into Romans and never come out, and I’m still doing my best to lead you through. But for now, we’ll take a break. This week, Psalm 119, verse 71. Next week, we’ll get the report from our Pittsburgh Ministry Team, and then 19th will be our Family Bible Week finale–and I’ve got a special message to go with our theme for this year. Today, Psalm 119, verse 71. Do you know much about the 119th Psalm? It’s the longest Psalm in your Bible. 176 verses! I’m not going to read them all to you today. Maybe some day, we will! And Psalm 119 is elaborately and carefully written to celebrate the psalmist’s relationship with God through His word. If you have the NIV, you’ll see that there are 22 sections of the Psalm, one for every letter in the Hebrew Alphabet. And most of them have 8 verses each that all start with a different word that begins with the letter of that section. A-B-C and so for, so to speak. It’s truly a literary work of art–and we don’t see some of how ahmazing it is because we have to translate it into English. In fact, the Hebrew word for “good” appears 6 times in these 8 verses, and I don’t think that that is a coincidence. There is something good going on in these 8 verses. But what we find out is good might be a little surprising to us! I quoted it, kind of badly, from memory last Sunday in the message, and it’s been on my mind all week. So, I thought we might study it more closely this morning together. I want us to focus on the peculiar perspective of verse 71. “It was good for me to be afflicted so that I might learn your decrees” (Psalm 119:71). That’s a peculiar statement if you understand what “afflicted” means. To be “afflicted” is to be troubled, pained, distressed, ailed, bowed-down, humbled, pushed, oppressed. Does anybody here like to be afflicted? Now, we’re not sure who the psalmist was. It might have been David, many of the psalms are by David, but they have his name attached to them. This one has no attribution. And we don’t know what this psalmist’s affliction was. Verses 69 and 70 describe how some arrogant enemies had slandered his name–perhaps it’s likely that’s the affliction he is referring to. But it doesn’t say that is so many words, perhaps so that we can apply this principle of affliction to lots of different areas in our lives, as well. Troubles. Hardships. Adversities. When things are going against us and it hurts and it’s hard, so hard. #1. IT CAN BE GOOD FOR US TO BE AFFLICTED. Now, that may not be what you wanted to hear this morning. At first, that sentence is not very comforting. Nobody wants affliction, and those few that act like it, masochists, are crazy. Affliction is painful and difficult and harmful and grueling. And it’s important to note that this verse does not say that the affliction was itself a good thing. It was a bad thing. It came to this poor guy because the world is fundamentally broken. The Bible is a realistic book. It describes things the way that they are. It doesn’t paint this painful experience in deceptive rosy terms. The psalmist is not saying that it felt good to be afflicted. The psalmist is saying that the end result of that painful affliction brought a benefit to him. It was worth it. In the end, it was good. It can be good for us to be afflicted. Now, I’ll tell you why I was attracted to this verse for today. This year has been a year of affliction for me, health-wise. I’m a little sheepish to say anything about this because I know that many of you have suffered much more than I have. Some of you have had the same things as I, and many of you have had much more difficult health problems. So, I’m hesitant to talk about it, but because I’d been relatively healthy for the first forty some years of my life, these new health battles, one after another, have really set me back on my heels. And they have caused me to think. As I said last week, I want to learn what I’m supposed to learn from these illnesses. From my diverticulitis. It flared up again this week. I’m on two antibiotics this morning. Not one, but two. Back in May, I had a perforated colon to go with it. I was worried this week that it had happened again. I missed prayer meeting because I was sick. And from my gallbladder attacks. If that’s what they were. I’ve had several tests now and some of them came back quite normal. My last one was a HIDA scan, a nuclear test where they lit up my gallbladder with stuff that has a half-life and took a video of it in operation. I hope to find out something from that soon and see what else is needed. As we said last week, Heather likes to say, “I hate your guts!” And I do, too, right now! But I want to learn what I need to learn from this experience of affliction. The other day, after they injected the radioactive stuff, they also injected some chemicals that simulate eating a greasy meal. And, oh, was that painful! Ouch! And I hadn’t eaten for several hours beforehand or slept for some reason so I was just miserable when my test was over. And I’m not yet feeling 100% yet. But I don’t say that to complain. I say that to say that I want that affliction to be GOOD for me. I want to learn the lessons God has for me in the school of affliction. All of us who are Christians can give this testimony, too, can’t we? I’ll bet that every one here has a story or two or two hundred about what God taught you through a painful experience. Am I right? It seems to me that God often teaches more courses in the school of affliction than He does in the school of blessing! C.S. Lewis in his little book The Problem of Pain says that God uses our pain to get our attention. We’ve all had those experiences. ...if we are willing to learn from it. That doesn’t mean that the suffering is good in and of itself. Suffering is bad. It’s a result of the Fall. It’s not good. And one day it will end. This also doesn’t mean that the suffering stops when we learn our lesson. Sometimes we joke that we want to learn the lesson of this school of pain so that we don’t have to repeat the course! But that’s not how this school works. Sometimes we learn plenty and yet the pain persists. But it does mean that God can redeem the pain of any affliction. That’s actually comforting when you think about it. That God can use the most painful things in our lives for our good. Whether they be illnesses, or attacks, or setbacks, or losses. Now, I wouldn’t share that truth with someone else who is suffering. Not right away. Job’s counselors had it right when they just came and sat with him. And were silent. That’s when they acted like his friends. When they opened their mouths, they got in trouble. We don’t lead with this when someone is suffering. But we who are Christians still need to know it. Here’s why? The second half of the verse. #2. WE CAN LEARN GOD’S WAYS. 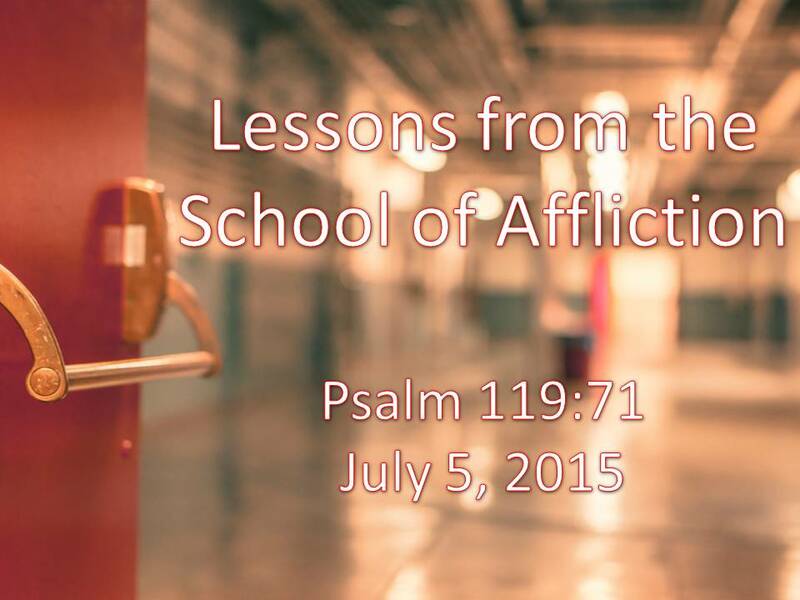 We can learn God’s ways in the school of affliction. It means written down instructions. The 119th Psalm is amazing in how it contains so many different synonyms for the Word of God. The psalmist must have worn out his thesaurus trying to come up with different words to mean basically the same thing–God’s holy Word inscribed in His Law. And the emphasis isn’t on the promises of God here but on God’s commandments, God’s instructions, God’s decrees of how a believer should live. We could say, “God’s ways.” God’s paths to walk in. When you study at God’s school of affliction you can learn how God operates and how God wants His followers to live their lives. And that, of course, includes believing His promises! Are you getting that out of your sufferings? I’m trying to learn God’s ways in the middle of mine. Sometimes God sends us affliction to discipline us and to get us back on the right track. Sometimes it’s a 180 degrees, sometimes it’s just a 1 degree course correction, but the painful nudge is what it took. I’m not saying that all suffering is discipline. But that that we can learn God’s ways from all suffering. Here are some things I’m learning, or think I’m learning from my present affliction. - It’s not all about me. My life is not all about me. Do remember when we studied the book of Genesis and we learned that God was the main character in the book? It wasn’t Abraham, or Jacob, or Joseph? That’s what’s coming to me recently. My life is not about me. It’s about God. So in pain or out of pain, what matters is the Lord and living for Him. And the same is true for ministry. This Pittsburgh Ministry Team is not about Pastor Matt. They will do just fine today and tomorrow without me. And if I end up not going on tomorrow or Tuesday as I’m now planning to, they’ll do just fine without me, then, as well. Because it’s not about me! It’s about the Lord. Here’s another things I’m learning in the school of affliction. - God meets you in your waiting. I’ve been in a lot of waiting rooms recently. Every doctor’s office has a waiting room. And some have more than one. And often even after you get to the last room, you still have to wait. So, I’ve been trying to learn to wait. I’ve never been much of a wait-er. I’m always pushing, trying to get the next thing done. I love to be productive. But I’m trying to learn patience in this season of my life. It’s not about productivity right now. It’s about patience. I’ve made an idol of productivity, of getting things done. I’m trying to learn to enjoy the right here right now. Look at all of the gifts God has given me. Let me enjoy each one in the moment. Not after I lose weight, after I get that next test done, after I feel better. And let me give thanks right now to that God that meets me in the waiting. I’ve been in too much of a hurry to get somewhere else when God was right here. Now, I’m trying to learn those things, I’m not saying that I have it down. But I think God is teaching me His ways in the school of affliction. I could tell you other things I’m learning: about love for others, about how much I’m loved by God and by His people, about how trustworthy God is, about good God is. But the point I’m trying to make is that in the school of affliction, the curriculum is God’s precepts, God’s decrees, God’s statutes, God’s law, God’s command, God’s word, God’s way. I’d rather be wise than rich. I’d rather have God’s wisdom, know God’s ways, than to have riches untold. And one of the best ways to get that is to be enrolled in the school of affliction. Not to enjoy the classes themselves but to wring out of them every bit of the knowledge of God that you can. Are you suffering right now? What might God be trying to teach you? It might hurt too much right now to think about that. Perhaps you just need to have your hand held and be told that God loves you. He is going through this with you right now. He hates evil and suffering. And one day He will wipe away every tear from your eyes, Christian. Maybe that’s what you need to hear right now. But when you have a chance and can think about it, think about whether or not there might be deeper lessons for you to learn from that painfulness. Is He trying to wake you up? Have you been going astray, and this is a wake-up call? Make verse 66 your prayer. I want to learn from this school of affliction! I want to be able to say when my life is over and pain (which has been very little in the grand scheme of things, I must say again). But when my life is over, I want to be able to sing this verse with the psalmist in the new heavens and the new earth. #14. What makes prayer effective?